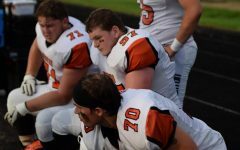 Finishing their season against Walled Lake Western, the varsity football team made another run into the playoffs this fall season. Despite not making it past the first round of playoffs, the work that got the team that far isn’t overlooked by them. Members of the team relied on their teammates to be successful. 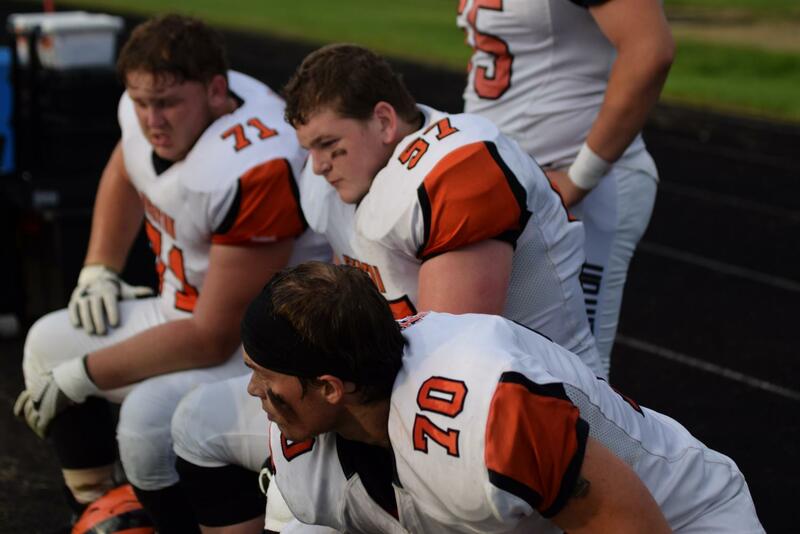 Members of the varsity football team rest on the sideline. 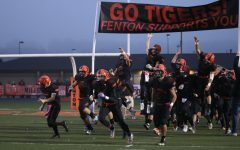 The tigers will face the Clio mustangs tonight for the homecoming game. The team’s success is attributed to the friendships they made. The Fenton cross country team had a successful season; winning their third straight Metro League Title and county championship on both the girls and boys teams. Both teams qualified for states, which is one of their big goals each season. The girls went a step further and won the Regional title, a first for the girl’s team. Despite being a strongly individual sport, the cross country team relies heavily on teamwork, and attribute their bond to the successful season. Sending seven girls and seven boys to the final state meet, the team was impressed with the final end to their season: “We placed about 17 spots higher than we were seeded to, so that was very good,” sophomore Gage Bond said. The Fenton cross country team was proud of their 2018 season and are already beginning to train for next season. To get involved with the cross country team, contact coach Jesse Anderson at jesse@redfoxoutfitters.com. After a season of hits, aces and sets, the girls varsity volleyball team ends their season after making it to the district finals. Here they conclude on their season. 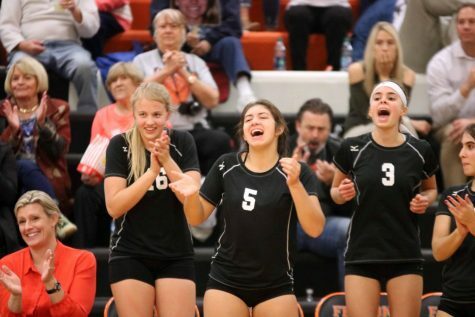 After winning the play, sophomore Sydney Sahr and juniors Jessie Bright and Anna Weigle cheer their teammates on against Goodrich. Oct. 24 was parent and senior night where the volleyball program honored the parents and seniors. Their season was cut short however as they lost to Grand Blanc in four sets at the district finals. Although they didn’t reach many of their goals, the team says they were still strong in some areas. 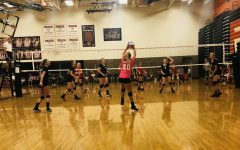 Those interested in joining the 2019-2020 girls volleyball team should contact coach Jerry Eisinger at jeisinger@fentonschools.org. The Fenton girls swim team concluded their 2018 season exceeding their goals that they had set before them; making it a “very successful season,” senior Caitlyn Dailey said. 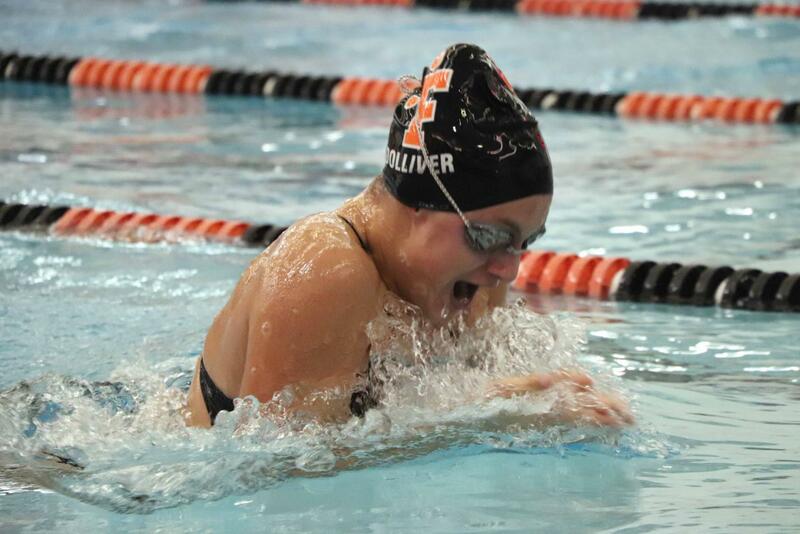 While coming up for air during her 100 yard breaststroke, sophomore Abby Dolliver takes the win against Grand Blanc High. The Fenton High girls swim team beat Grand Blanc 200-150. The team achieved many of these goals including: taking first at Counties, Metros and Regionals; beating Grand Blanc in a dual meet. After competing in multiple qualifying meets, the girls team made it to states, taking 14th place overall. 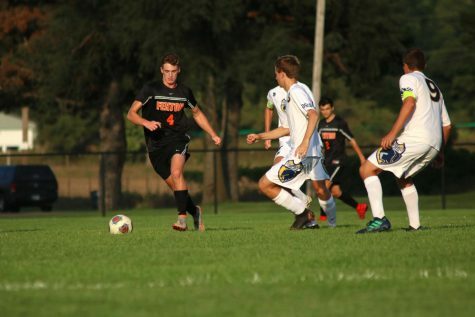 The boys soccer team kicked their way to district finals in this fall season, summarizing it as a “huge success,” varsity boys soccer coach Matthew Sullivan said. Racing to the goal, senior Brady Young dodges his Owosso opponents. The boys varsity soccer team won their game against Owosso with a score of 6-0 on Sept. 12. While the team has goals of making it far in the competition, they also make it a priority to have fun while doing it. Freshman Ben Chapple says that the team had lots of fun and was able to bond fairly well. Despite some struggles, the team pulled through and created bonds that led to success in their season, beating Linden in overtime in the district game. In the rain, wind and cold, the girls golf team braved the weather this season as they went 8-0 in dual meets for their regular season. This season the team welcomed exchange student Charlotte Cunaud from France. Cunaud earned First Team All-Metro this season as well as qualified for states. Still, the team made great strides and had four players on the first team all-league. After months of serves, strokes and backhands, the 2018 boys tennis team rounds out the season with four wins and two losses. 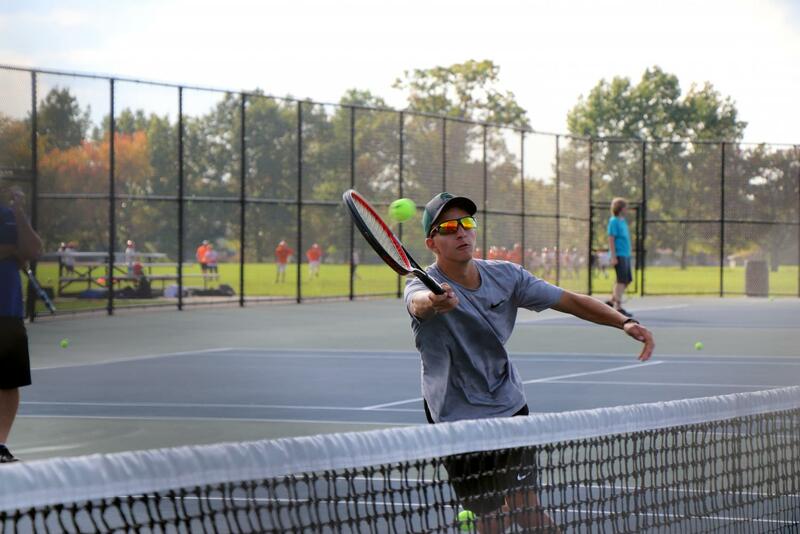 The Fenton boys tennis team ended third in the metro but fell short of making it to regionals. On Oct 9, during the varsity tennis boys’ practice, junior Trevor Bloss serves the ball back to his coach. They wrapped up their season last night. Throughout the season, the team welcomed exchange student, Tymek Barcinski. Playing table tennis in home country of Poland, Barcinski says he enjoyed every single minute of being on the tennis team this year. Losing two seniors and an exchange student, the team looks to the underclassmen to step up for the coming season. As the team begins to prepare for the next season, those interested should contact varsity coach Gary Ballard at cashnowguy@yahoo.com.